I normally charge an average of $150 for my adult geese. 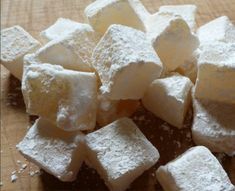 However, I desperately need to cut back my numbers, especially ganders. I’m practically giving these guys away, and you’re probably not going to find these bloodlines at this price.I only offer local pickup. I do not ship live birds. I know other breeders do it, but I’m simply not willing to risk the death of my birds in shipping. I accept payment by cash or PayPal. Grey Male $50 – I love this guy so much, because he looks so much like his grandpa (who I no longer have, thanks to a coyote attack a few years ago). He’s such a handsome guy! His father is split for buff, so it’s possible he is too. Blood lines in his background include Cottage Rose, Kelly Farm, Holderread, Overton, Ribbeck. 2018 hatch. 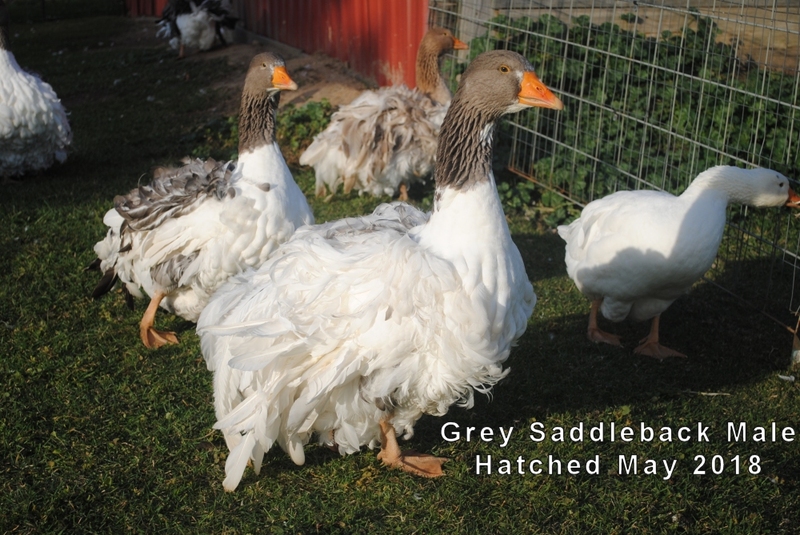 (Sold) Saddleback male $50 – This guy is possibly split for buff, as his father is. 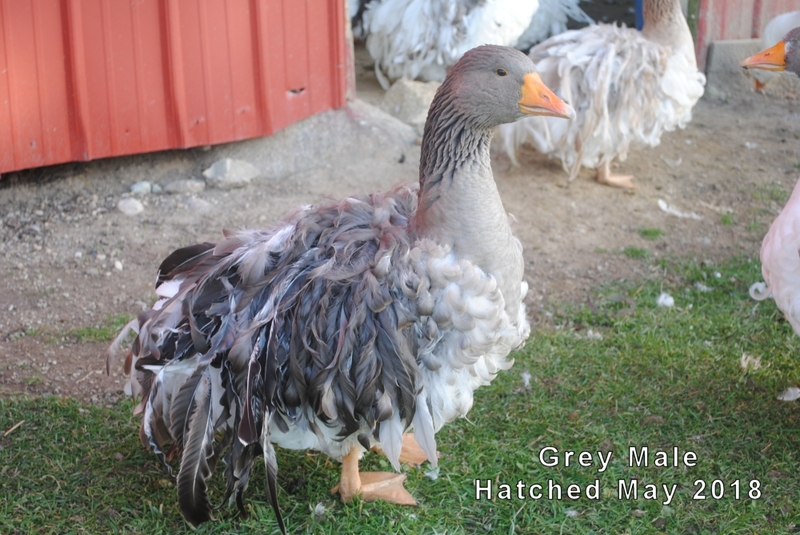 He’s a full brother to the grey gander above. Blood lines in his background include Cottage Rose, Kelly Farm, Holderread, Overton, Ribbeck. 2018 hatch. (Sold) Saddleback female $25 – I’m a little heartbroken about this little girl, and am having to sell her as a pet quality bird. She was almost perfect, but her left wing developed very prounced twisted wing tip. It is NOT angel wing, which involves a deformity of the wing joint. Unfortunately, American breeders have been so agressively breeding for curl that TWT has become relatively par for the course in the breed. TWT is not present in the European standard. 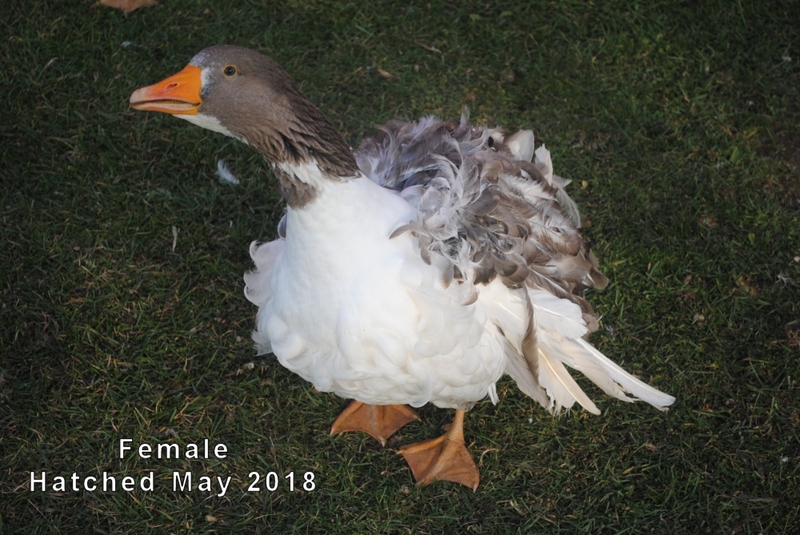 In my breeding program, I’ve introduced a European style male to my flock, and am working to improve wing shape and feathering. This girl SHOULD NOT be used to breed. She’s just looking for a nice farm with other geese to keep her company. 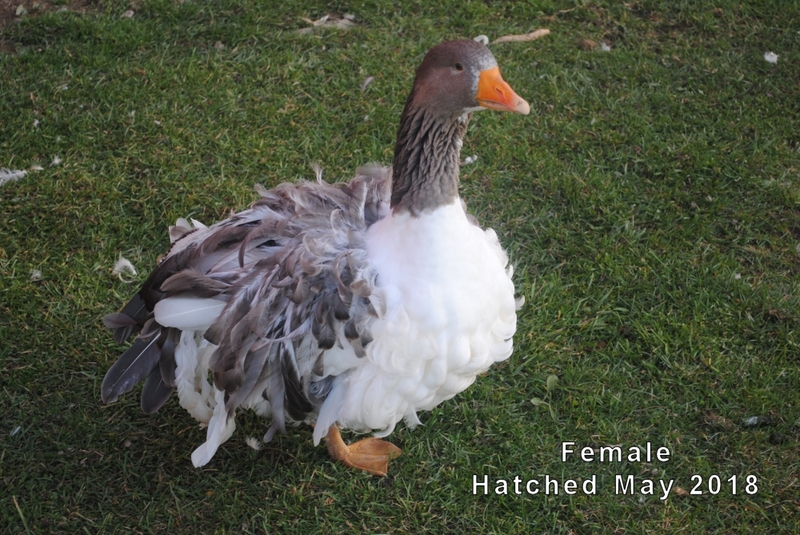 I will not sell her as a single to a home without other geese. Geese are social animals, and should not be kept alone. If you are interested in one of my males, I may be willing to offer this girl for free. It’s up for discussion.